A vigorous woody vine that adds year round texture and interest to the landscape. 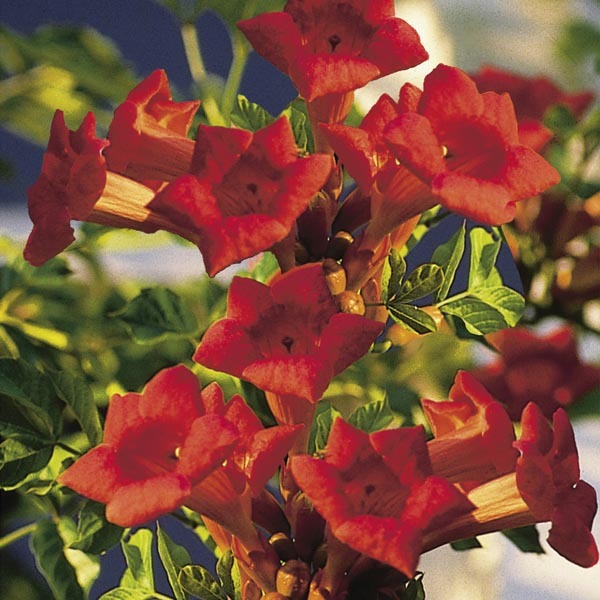 Large trumpet-like blooms bring a burst of warm color to the late season garden. Lush, dark green foliage provides the perfect backdrop for mixed plantings. Great for privacy screening on decks or blocking unsightly views. Commonly used to climb fences or walls. Terrific plant for hummingbird gardens. Best used for large scale plantings. Tolerates poor soil, heat, and drought. Best in fertile, well-drained soil. Allow soil to dry between thorough waterings. Provide climbing support, tying shoots up until well established.